Their most supportive political party (Senterpartiet, Sp) is mired in national shame and scandal but that hasn’t stopped Norway’s powerful farmers’ lobby from demanding NOK 1.8 billion in additional taxpayer funding for next year. The support would once again come in the form of subsidies and tariff protection from imported agricultural products. The farmers formally turned over their latest round of demands for financial assistance to the state Ministry of Agriculture on Thursday, claiming the hundreds of millions of kroner was needed to cover increased costs. The money would also provide farmers with an average pay increase of NOK 25,000, more than twice what most workers in Norway can expect to receive from ongoing labour negotiations. The farmers insist they deserve the higher pay to compensate for income levels they claim have been lower than in other sectors over the years. The farmers specifically want extra state funding for small- and medium-sized dairy farms located in remote areas to subsidize their operations. They’re also seeking state funding to stimulate increased prodution of grain, potatoes, vegetables, fruit and berries, along with organic production of such products. As part of their annual public relations campaign to drum up support from Norwegian taxpayers, one farmer in Sogn og Fjorane told state broadcaster NRK that he only earns around NOK 70 (USD 8.70) an hour because overproduction of lamb and pork in Norway led to falling prices. Small farmers have objected to how large farmers, they claim, have received state stimulation to consolidate and boost production through more centralized operations that provide economies of scale. The small farmers want to be able to earn a decent living from their far less efficient operations in remote locations that also boost transportation costs. They also cite a report from the Norwegian institute for bio-economy (NIBIO) that shows farmers earning an average of NOK 330,000 a year, compared to NOK 440,000 for industrial workers and around NOK 525,000 for public sector workers. Consumers in Norway rarely benefit from higher agricultural production, however, because of strict market regulation aimed at keeping prices high. Farmers’ coops such as Nortura have thus frozen and stored excess lamb meat instead of offering it at lower prices that could boost sales volumes. Agricultural politics in Norway are complicated and entrenched in regulatory systems that the conservative government coalition has been trying to reform in recent years, not least as part of efforts to lower Norway’s notoriously high food prices. 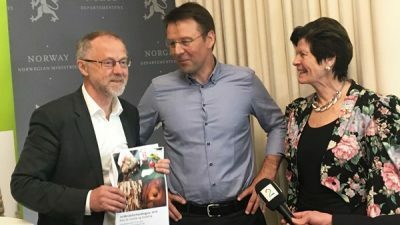 The farmers’ demands, presented by the two main lobbying groups Norges Bondelag and Norsk Bonde- og småbrukarlag, did not receive a warm welcome at the ministry on Thursday. “This is an extremely demanding starting point for this year’s negotiations,” said Leif Forsell, the chief negotiator for the state. He pointed to both challenges in the marketplace and cost growth. Forsell also noted that “farmers are not wage-earners, they are private, sole proprietors and the main portion of their income must come from the market through sales of food- and other products.” The farmers themselves, he suggested, have not done a good job at avoiding over-production and subsequent price declines in the market. They’re now trying to claim direct subsidy from the state itself through allotments in the state budget. The state will formally respond to the farmers’ demands with a counter-offer from the ministry late next week. Negotiations will then proceed until a mid-month deadline for a settlement. The farmers are not helped by the ongoing crisis in the Center Party (Sp), which traditionally has fought hardest for their interests in Parliament. Sp leaders are caught up in a sexual harassment scandal set off by an obscene message sent to a former female party leader from a group of 10 men, eight of whom hold or have held powerfup Sp positions. Now they’ve been nationally embarrassed, also because none of the men will admit to having actually sent the offensive message. The case has now been reported to police in an effort to flesh out the guilty man, and allow party leaders to turn their attention back to politics. On Thursday came news that a new sexual harassment complaint had been filed with party leaders as well.